First of all, thank you all so much for your awesome response to Afternoon Tea volume one! I’m hard at work on the next one, which will shoot in late August. 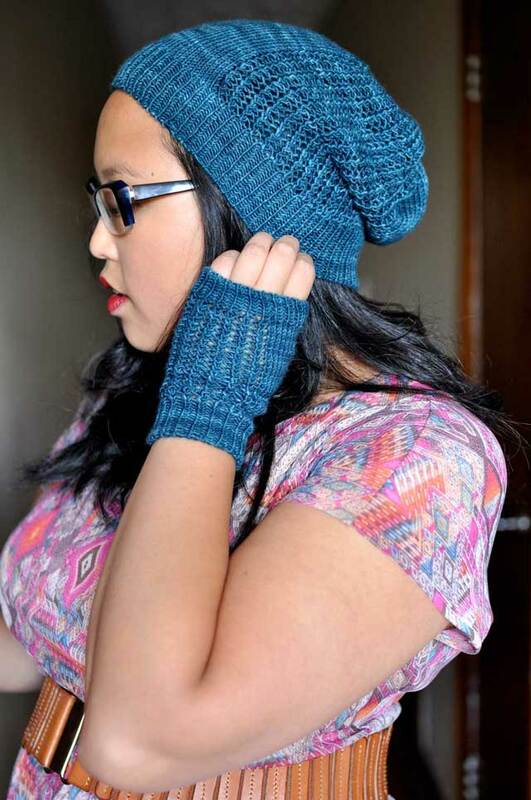 Kind of tough to work on fall/winter stuff in the summer, but such is the life of a pattern designer. I’ve also been super busy working at lettuce knit, and dealing with some family medical issues (good vibes for my dad’s recovery from heart surgery would be appreciated). But luckily I have a lovely spot to sit and knit now – my apartment (which you may remember I moved into late last summer) is on a second floor and has a nice big porch out front. I’d been without outdoor space for a couple years before moving here, so I was really excited to start up a container garden again! It’s been a pretty slow process of getting things ready, finding containers and everything, but now that it’s warm out the plants seem to be humming along. 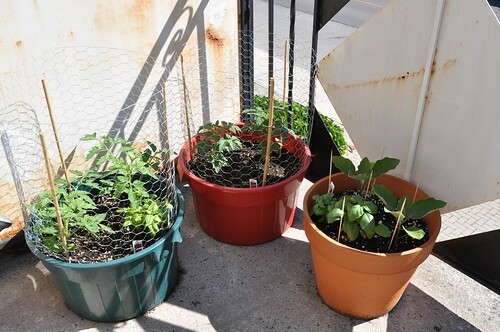 First thing I planted in late April was peas, in just a plastic container from Ikea – I have a pretty random assortment of containers, mostly plastic pails. 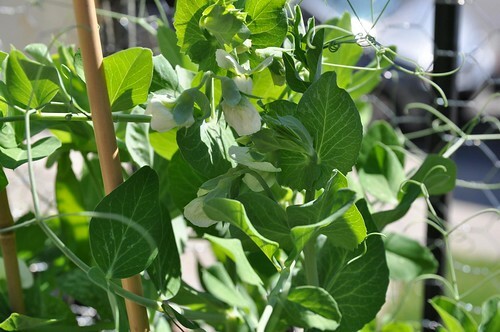 The peas are flowering now and there are few pods too. There won’t be a huge harvest or anything, probably not even enough for a meal, but raw peas straight off the vine are such a treat! The chard I planted is doing pretty well, though it was slow to germinate. It’s Rainbow Lights, so the stems will be different colours. Poor romaine. 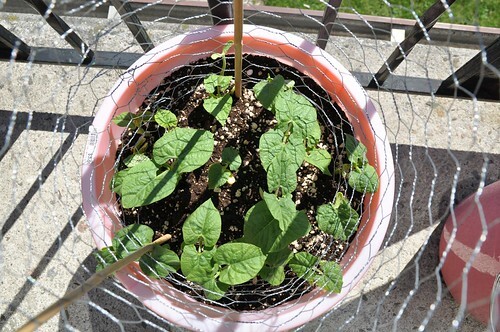 It got nibbled at pretty well before I got some chicken wire (the peas too). 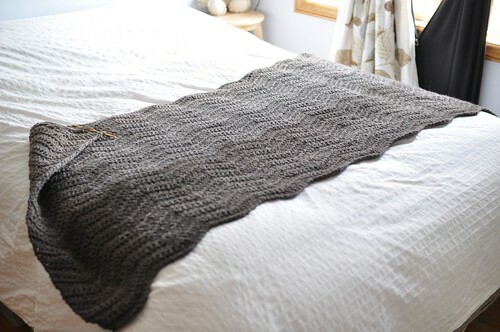 It’s finally growing pretty well, but I need even more chicken wire! 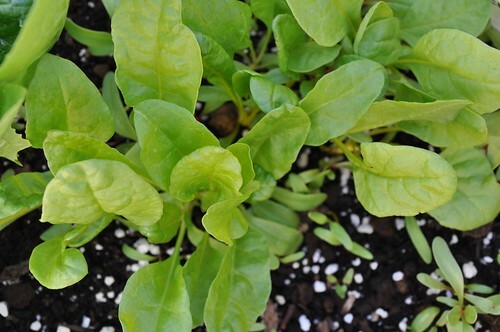 Basil – I love basil and I have about 8 plants! The container on the left is what I grew from seed, the rest I bought. Just planted beans last week and they’ve popped up really nicely! I’ve got tendergreen and royal burgundy. Left to right: Early Girl tomatoes, Husky tomatoes, Bambino eggplant and basil. I know I’m pushing my luck with 2 tomatoes in the same planter. I can’t decide whether I want to spend money on more planters, more soil, and more plants – it’s a slippery slope. I got a nice folding table and chairs from Ikea and we’ve eaten dinner outside a few times. It’s quite lovely. 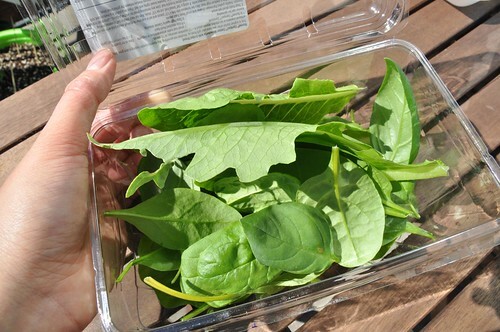 Today’s first harvest – baby spinach, baby chard, a few leaves of romaine and some basil. A tiny salad? What a lovely patio! 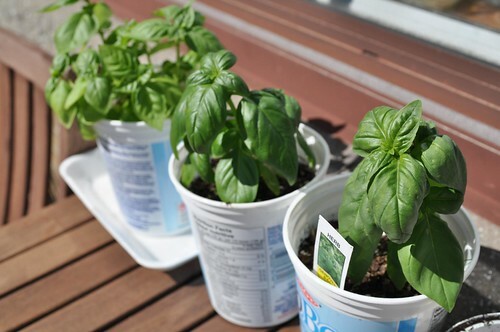 I planted 2 basil plants this year… I need more. Thanks for the inspiration! Lovely little garden! I covet your basil… I’m excited to be moving to a place where I can have some mint and basil and assorted herbs. I loooove mint tea. “They” say two plants in a pot yields more than one plant but less than two plants in different pots, so I think your risk will pay off. Every year I garden I plant more and more things. It’s calming and relaxing and completely addicting. This year is my first year gardening in the South and with luck come mid-summer we’ll be enjoying some sort of boozy drink with fresh watermelon and basil that we grew ourselves. 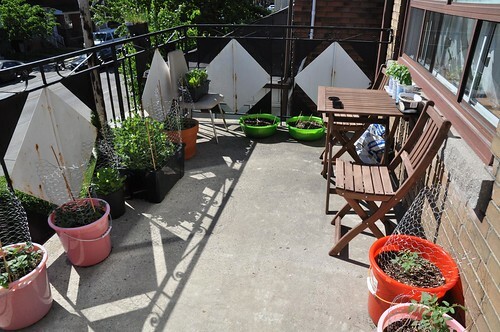 What a wonderful patio garden space! 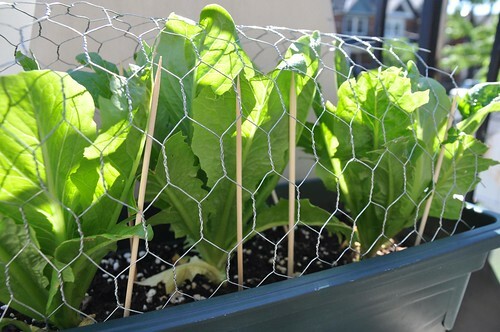 I had to put chicken wire around the entire garden this year, as my chickens love what I plant! Ages and ages ago my family had a little backyard vegetable garden. You make it look like so much fun, I want to try one again! Love your basil. attempted them from seeds too. they grew nicely at first then started dying. Thought it was too much sun but looks like yours get quite a bit of sun. Any pointers? I’m going to try again. I live in NJ. Thx.